little burritos with Brussels sprouts, refried beans, and mozzarella cheese. For a long time, I was convinced that I wanted no part of these little veggies. But guys, they aren’t so bad! In fact, when sauteed in a little olive oil and seasoned with salt and pepper, they are pretty delicious. That’s exactly how you prepare them for this recipe. 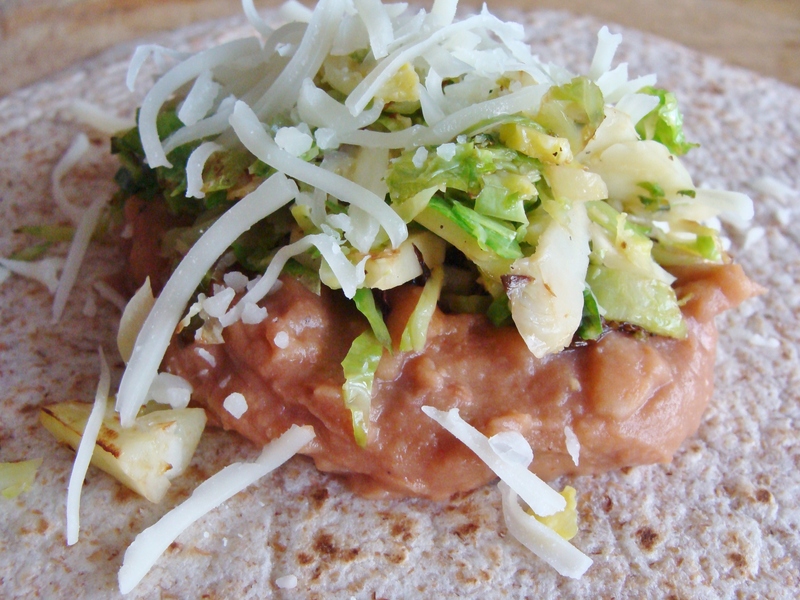 Tasty sauteed sprouts combined with refried beans and mozzarella cheese wrapped in a tortilla = excellent flavor package. I’m always looking for healthy, but hearty, lunch ideas—particularly something that I can make ahead of time on Sunday for the entire week. This recipe made 5 little burritos, and I have reheated one each day this week for lunch at work. You could definitely use full-size burrito tortillas if you like–if so, this recipe will give you 2-3 generous servings. I just preferred something slightly smaller for my lunch, so I used taco-size shells. These little burritos were inspired by a recipe I saw on Big Girls, Small Kitchen (which was inspired by a recipe from Weelicious Lunches) – it’s a big circle of inspiration, guys. Remove the outer layer of each sprout, and then chop off the bottom stem. Rinse with cold water and pat dry. 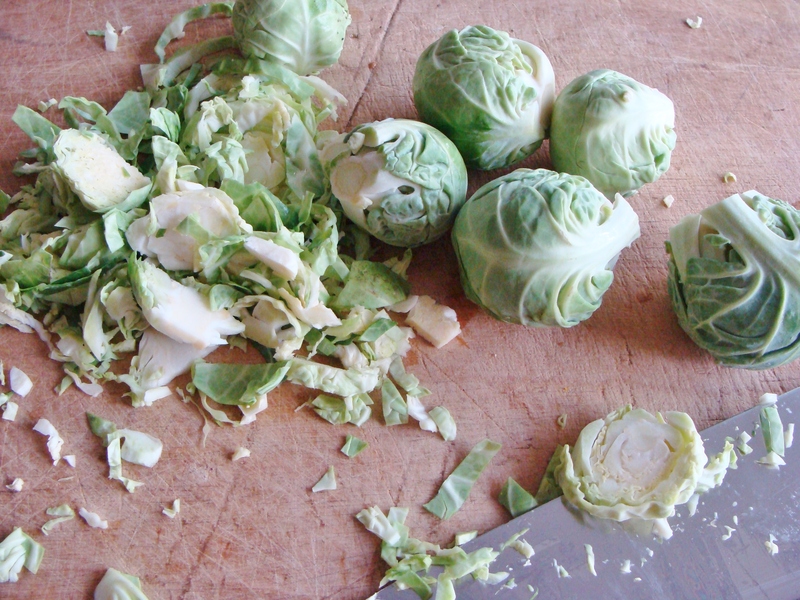 Finely chop the sprouts. Heat a tablespoon of olive oil in a skillet over medium heat. Once hot, add your chopped sprouts. Season with sea salt and black pepper. Cook for 5-6 minutes, until the sprouts start to brown. Remove from heat. Warm your refried beans, either in a saucepan or microwave, per package instructions. I seasoned my beans with a bit of garlic salt. Time to construct your mini-burritos! Lay out your tortilla shell. Spread a spoonful of refried beans in the center of the tortilla. Top with a spoonful of the sprouts, then a sprinkling of mozzarella cheese. 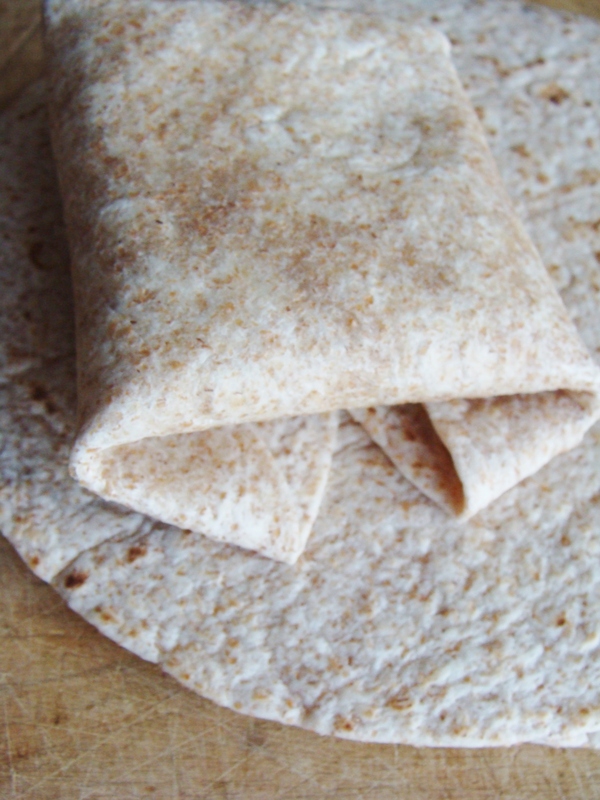 Construct your burrito—fold two sides in, then tuck under the ends. Because I was saving mine for later, I wrapped each burrito in wax paper for easy reheating at work. To warm, heat the burrito in the microwave for 45-60 seconds. 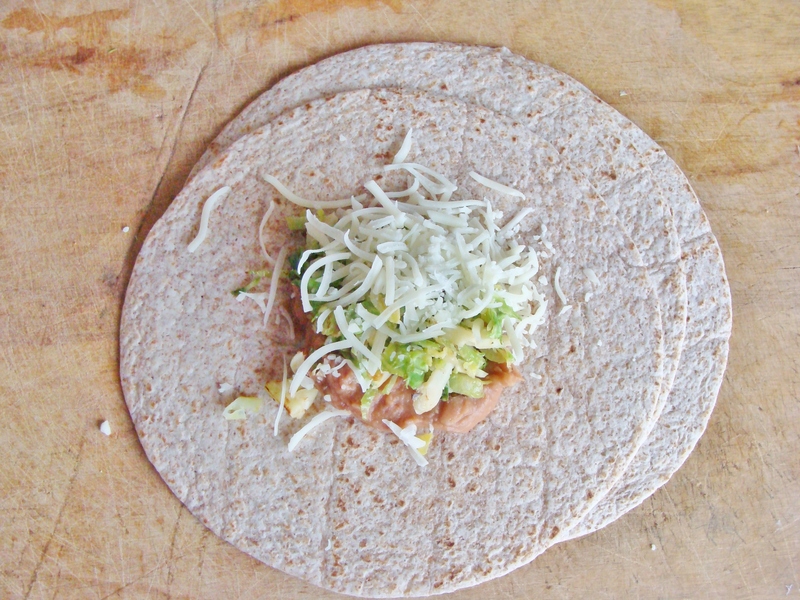 § 3 Responses to little burritos with Brussels sprouts, refried beans, and mozzarella cheese. These sound really good, I’ve never thought of using brussels sprouts like this! You are currently reading little burritos with Brussels sprouts, refried beans, and mozzarella cheese. at The Cheesy Kitchen.